How much you know about blood types and blood donation? Posted in Health & Wellness on January 6, 2011. Last modified on November 09, 2018. Read disclaimer. If you've hesitated to give blood, the following facts from the American Red Cross might motivate you to give. 1. 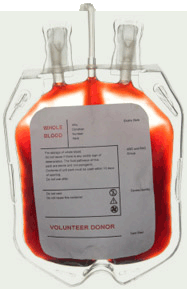 A transfusion of an incompatible blood type can cause death. 2. Thanks to technology, blood can now be stockpiled until it is needed. 3. It's possible to donate only certain parts of your blood. 4. Every single unit of donated blood is tested before every single transfusion to identify diseases that can be transmitted by blood. 5. Thanks to advances in medicine, the demand for blood is decreasing every year. 6. Blood donations are most needed when a large disaster occurs. 7. Some people have U-negative blood. 8. Nearly all people of Asian descent have an Rh-positive blood type. 9. Scientists have developed synthetic blood that can be used as a substitute for human blood if not available. 10. You can't donate blood if you're under 21 years of age. Feeling tired, worn out or burned out? You may be suffering from Stress Overload. Busyness, overload and stress can happen to any of us. Often we don't feel stress sneaking up on us. Anyone living in today's fast-paced society knows the struggle of trying to handle the load of life. You don't have enough time to do the things you have to, let alone those things you'd like to do. As a result, you may begin to feel exhausted or lethargic. Stress will manifest differently for different people. Some can handle one kind of stress, while others thrive on what would break some people down. Stress can have devastating effects on your health and happiness. Consider these danger signs: difficulty concentrating, moodiness, stomach problems, headaches, skin rash, trouble sleeping, social withdrawal, smoking or drinking excessively, overeating, panic and anxiety attacks and depression. Another big sign is feeling paralyzed and unable to take action due to being overwhelmed. If three or more of these symptoms apply to you, take action immediately. You cannot continue this lifestyle without experiencing serious side effects. Chronic stress disrupts nearly every system in your body. It can raise blood pressure, suppress the immune system, increase the risk of heart attack and stroke, contribute to infertility and speed up the aging process. You may feel like the overload stress in your life is out of your control, but it's not. You can always control the way you respond. Sometimes that requires that you lower your expectations and quit trying to be a superhero by taking on more than what you can manage. Managing stress is all about taking charge: taking charge of your thoughts, your emotions, your schedule, your environment, your social calendar and the way you deal with problems. changing a stressful situation, when you can - or changing your reaction when you can't. Before adding new projects to your already busy lifestyle, consider your current activities and obligations. It's essential to learn to accept the limits and finality of the 24-hour day. You will be doing your health and happiness a big favor! Source: VitaJournal, March 2011. Article by Judy Ellison, Ph.D., a psychologist, author and motivational speaker. She has inspired people around the world to reach within and find their passionate purpose to live a more meaningful life. Time to bust out the measuring tape: a large waist size is increasingly being linked to heart disease risk. Even those who are of normal weight can be contenders for heart problems if they have a large waistline. In a study in the journal Circulation, waist size alone predicted heart disease risk, regardless of other measures including body mass index (a weight-to-height ratio). Even though overweight and obesity are well-known risk factors for heart trouble, if most of a person's excess weight is around their abdomen rather than their hips, they're at increased risk of heart disease and Type 2 diabetes. And that risk goes up a few notches when waist size is larger than 35 inches for women and 40 inches for men. Most fat lies below the skin -- subcutaneous fat. 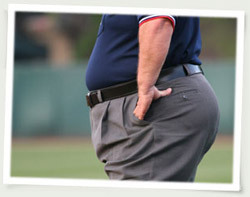 Abdominal fat, on the other hand, can sometimes be "visceral" fat, which lies between and around organs. Visceral fat can churn out harmful substances in your body, which can trigger a host of conditions such as high blood pressure, high cholesterol and insulin resistance -- all of which contribute to a higher heart disease risk. Visceral fat can quickly accumulate in those with a sedentary lifestyle. A Duke University study found that those who did not exercise had an average 8.6% increase in visceral fat after eight months. Notably, sedentary women gained less weight than men but experienced an 11.6% increase in visceral fat versus a 5.7% increase seen in men. To correctly measure your waist, stand and place a tape measure around your middle, just above your hipbones. Measure your waist just after you breathe out. Remember, an optimal measurement is below 35 inches for a woman and below 40 inches for a man. Low levels of Vitamin D associated with mental decline. Exeter, England - Older adults with low Vitamin D levels are more likely to have thinking, learning and memory declines according to a recent study in the Archives of Internal Medicine. Researchers from the University of Exeter in England followed 858 adults age 65 and older for a six-year period. Blood samples were collected from participants and at intervals throughout the study, they were given three tests of cognitive (mental) function. Those with severe Vitamin D deficiencies were 60% more likely to have substantial cognitive decline and 31% more likely to experience declines in executive function (ability to plan, organize and prioritize) than those with sufficient D levels. An estimated 40-100% of older adults in the United States and Europe are Vitamin D deficient. This deficiency has been linked to fractures, a variety of chronic diseases and even death.